Blackboard Maintenance Update – What’s New? Last night, our Blackboard instance went through a scheduled maintenance that brought us to version 9.1 Q2 2017. While the version may not mean much to you, we wanted to take the time to let you know about what new features you have in store when you return in the new year. Starting January 4th, we will offer a fully-online course (in Blackboard) where you can learn about Ally, how it works and even earn a “Blackboard Ally” certification. Enroll today! Blackboard’s original way to do inline grading (Crocodoc) has been upgraded and replaced by the owners of that software (Box Inc.) to Box View. Box View offers several improvements over Crocodoc, including improved rendering fidelity and expanded support for new file types. Check out this list of over 100 different supported file types. For more information, watch this video from Blackboard. Aside from these great new features and tools, Blackboard also squashed some bugs that had been pestering us. Happy new year! 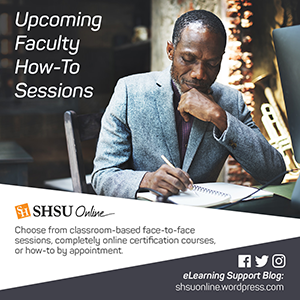 SHSU Online is pleased to offer a number of faculty development opportunities for January 2018.